Kuldeep Yadav picked up two wickets in the third and final T20 International against New Zealand that India lost by four runs to suffer a 1-2 series defeat in Hamilton on Sunday. 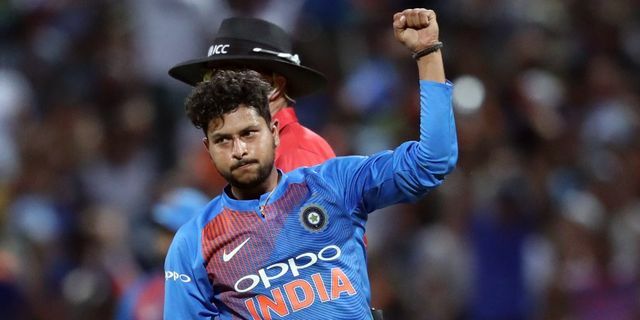 However, left-arm wrist-spinner Kuldeep Yadav moved one place up to claim a career-best second position in the latest T20I bowlers' rankings, released by the International Cricket Council (ICC) on Monday. After missing the first two matches of the three-T20I series, the 24-year-old spinner dismissed New Zealand openers Tim Seifert and Colin Munro in the series decider and reaped immediate dividends. Mitchell Santner rejoiced in New Zealand's T20I series win that came after 1-4 routing in the five-match ODI series. Spinner Santner climbed four places up to enter the top ten rankings. Santner is placed 10th, while India's Krunal Pandya advanced 39 places to seal a career-best 58th rank.